Be the first to share your favorite memory, photo or story of Jennette. This memorial page is dedicated for family, friends and future generations to celebrate the life of their loved one. Jennette F. Maturo, age 104, of Wolcott, passed away on November 20, 2018. Born in New Haven on April 1, 1914, she was the daughter of the late William & Florence (Miller) Hamilton. Jennette was the widow of James Maturo. She was a resident of Hamden most of her life before moving to North Haven, then subsequently Wolcott. She attended New Haven Teachers College and acquired her Teachers Credentials, and was also employed as a bookkeeper for the former Eder Brothers Company. She is survived by her daughter and son in-law, Margaret & Charles Sampson of Wolcott, and her grandson, Senator Elect/Representative Robert Sampson of Wolcott. 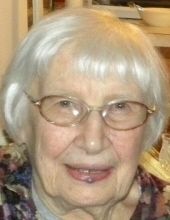 Jennette was a longtime member of Grace & St. Peter Church in Hamden. Friends may attend her Graveside Service on Friday, November 23rd at 2:00 PM in Centerville Cemetery, Washington Ave., Hamden. Arrangements are in care of Beecher & Bennett Funeral Home, 2300 Whitney Ave., Hamden. Contributions in her memory may be made to the Susan G. Komen Foundation; www.komen.org. To send flowers or a remembrance gift to the family of Jennette F. Maturo, please visit our Tribute Store. "Email Address" would like to share the life celebration of Jennette F. Maturo. Click on the "link" to go to share a favorite memory or leave a condolence message for the family.